When questioned by reporters, Mollinedo gave an inaccurate figure for the wall's height, putting it at 18 feet. Then, two days after the attack, he acknowledged the wall was only 12½ feet – or 4 feet below the recommended national standard. To bolster the "blame the victims' strategy, the zoo's newly hired crisis-management specialist, Sam Singer, admitted to furthering a highly inflammatory false rumor, that slingshots had been found. On Tuesday, Singer stated he was just "passing along" the slingshot story. Mark Geragos, the lawyer for the mauled survivors of the tiger attack, lambasted Singer's tactics as “an abomination” and threatened to sue for defamation. “To be attacked by a tiger, number one, then to be attacked viciously by false and defamatory stuff is too much,” Geragos said. The zoo's claim that "something had to have happened" to "make the tiger" climb or jump over its enclosure was bolstered by a report in the San Francisco Chronicle. 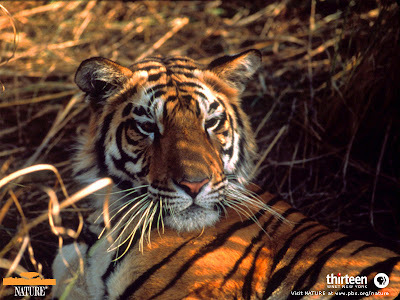 A woman read of the tiger attack the next day and contacted the Chronicle. In a San Francisco Chronicle article, zoo patron Jennifer Miller reported that she, her husband and children saw four young men at the big cat grottos and that three of the men were teasing the lions. Ms. Miller said that she called the zoo to report the obvious "taunting." "The boys, especially the older one, were roaring at them. He was taunting them," the San Francisco woman said. "They were trying to get that lion's attention. ... The lion was bristling, so I just said, 'Come on, let's get out of here' because my kids were disturbed by it. Miller called their behavior "disturbing." We wondered why, if this woman thought the behavior of the young men, so "disturbing", she didn't immediately report them to zoo officials, while still at the zoo. The San Francisco Mayor, Gavin Newsom, has stuck by Mollinedo even though a zookeeper was attacked back in September by the same tiger. According to a story by UPI on September 7, the zoo had reopened its tiger and lion exhibit after spending $250,000 in safety upgrades to the "dining hall" area. A zookeeper filed a lawsuit alleging that better security could have prevented an attack by a Siberian tiger back in December. The zoo is also under attack by animal rights activists who accuse Mollinedo of "putting entertainment" over the animal's well-being. “There just been a lack of respect for the animals to increase foot traffic,” Katz said. Mollinedo's crowd-pleasing initiatives, such as public feedings of big cats, have made them more aggressive, he said. 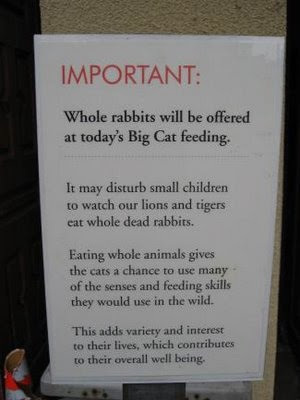 Warning Sign, SF Zoo, "Big Cat Feeding"
And yet, something so simple as raising the walls on the tiger grotto another four feet might have kept one man and one tiger alive. Especially after the same tiger's past record of attacking a zookeeper just a few months earlier. Now the city will most likely face substantial civil lawsuits from the victims and their families. Instead of owning up to the truth, that the walls were deficient, Mr. Mollinedo and his cronies chose to blame a now dead 17-year-old boy whose throat was slashed by the tiger. A Siberian tiger, doing what all tigers do, shot dead. Two young men left to deal with lasting memories of the final seconds of their friend's life at the hands of tiger, in a place that was supposed to be safe.